Gov. Bruce Rauner called half of Chicago teachers “virtually illiterate” in 2011. Chicago Teachers Want Their Governor To Know That They Definitely Know How To Read. Chicago teachers are most definitely not illiterate, and they want their governor to know it. When Rauner sent the email he was an executive at a private equity group that was involved with the Chicago Public Education Fund, a philanthropic education reform nonprofit that invests in local school initiatives. Rauner sent the email to several of the Fund’s wealthy leaders to advocate for a strong teacher evaluation system in the district. It was released after the Chicago Tribune sued for access to emails regarding a scandal involving Chicago Public Schools. “Teacher evaluation is critically important, but in a massive bureaucracy with a hostile union, where 50% of principals are managerially incompetent and half of teachers are virtually illiterate, a complete multi-dimensional evaluation system with huge subjectivity in it will be attacked, manipulated and marginalized — the status quo will prevail,” Rauner wrote. In response, teachers have started a “teachers read” hashtag, detailing their reading selections. Public education leaders in the city and state are deeply angered by the governor’s remarks. 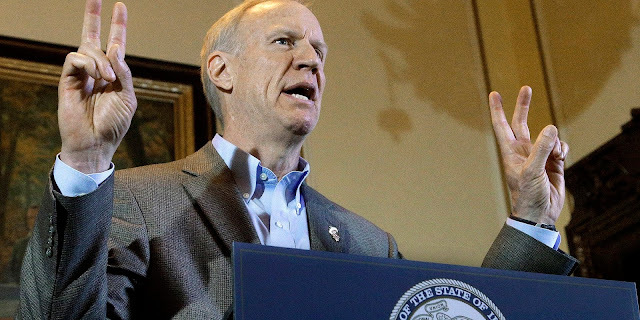 President of the Illinois Federation of Teachers, Dan Montgomery, called the governor’s words “a grotesque affront to the thousands of dedicated, hardworking, and talented educators and, indeed, the children who learn from them and love them,” reported DNAinfo.